I remember when I first watched the Neverending Story for the first time as a kid in the 80’s. Until that movie I had never seen anything that was immersed in the culture of fantasy mythos, as at this time I was a few years from getting my first black box Dungeons & Dragons set and starting down a lifelong road that eventually would bring me to here, co-writing a gaming blog and testing the waters of 3rd party and freelance game design. But at the time I first saw the movie I was hooked, talking wolves and giant racing snails with tiny riders, luck dragons and rock biters, all set against the tale of Bastian and Atreyu, heroes with a complex problem (the Nothing) to deal with. That could have been very well a watershed moment in my own life, perhaps if I had never watched that movie, I may have never wanted the black box, and might not be writing this article today. But I did watch, I did get my beloved Grandma to buy me the black box for Christmas a few years later, and I did end up a writer, so without further delving into the past, Jeff Crunch this week presents Gmork, Gluckuk, and the racing snail. Enjoy and remember creation is the best way to fight the Nothing, and our horribly droll culture as well. 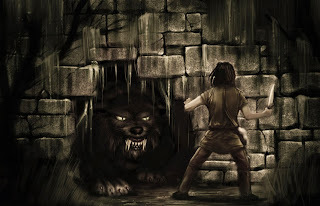 Description: Gmork is a cunning and ferocious worg, one that has lived so long that he has surpassed all his brethren in intelligence and power. Thick black fur covers the huge wolf and six long fangs adorn his muzzle, his malicious yellow eyes burn with hate and hunger. Space15 ft. Reach 10 ft.
Before Combat Gmork prefers to use stealth to stalk prey and gain surprise. biting them mercilessly one at a time until dead. Morale Gmork flees if reduced to 20 hp or less or is dealt severe (30% of hp +) fire damage. Feats Improved Initiative, Improved Natural Armor x2, Improved Natural Weapon (bite), weapon focus (bite), Weapon Specialization (bite), Dodge, Skill Focus (stealth), Improved Critical (bite). Skills Acrobatics +12, Climb +15, Handle Animal +6, Intimidate +7, Knowledge (nature) +3, Perception +14, Stealth +14, Survival +14, and Swim +13. Gaze (Su): Gmork is able to muddle the thoughts of others with his vile yellow eyes. Those meeting Gmork’s gaze are dazed for one round unless they succeed on a DC 15 will save. Spark of Life (Ex): A savage warrior gains a +1 bonus on saving throws made against energy drain and death effects. This bonus increases by +1 for every four levels beyond 2nd. Natural Savagery (Ex): A savage warrior gains a +1 bonus on attack and damage rolls with natural weapons. This bonus also applies to CMB and CMD for grappling. This bonus increases by +1 for every four levels beyond 5th. or overrun combat maneuvers made when charging. this ability as a free action. granted BAB. A fighter without hands is still a fighter in my book. with a luster like finely polished teak wood. It moves over the forest floor with amazing speed and grace. Before Combat Racing snails generally avoid combat unless urged by their riders. avoiding attacks rather than attacking. 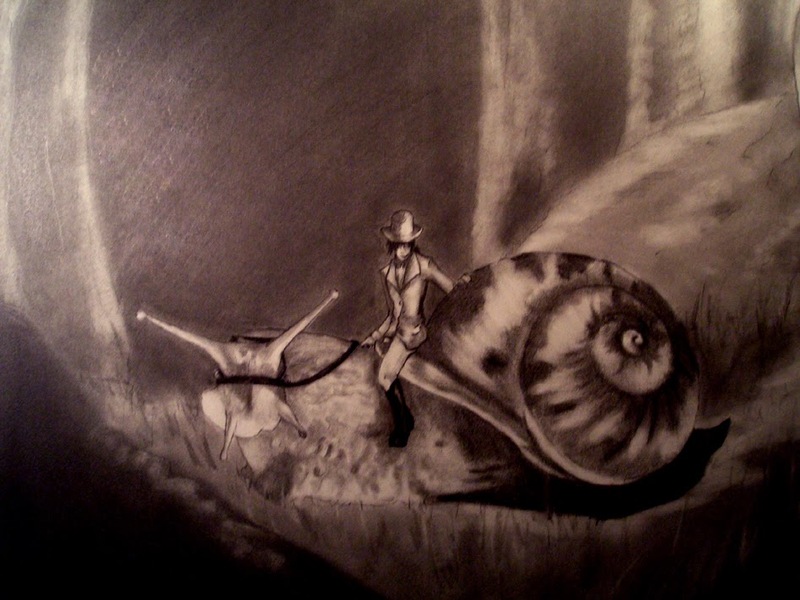 Morale Racing snails normally flee combat at the first opportunity unless urged otherwise by their rider. Description: This tiny but handsome brownie sits astride a large snail, holding its reins in one hand. Before Combat Gluckuk prefers to not engage in combat unless at the very end of need. lightning fast charges if no other option for escape or parley exists. Morale Normally if carrying a missive Gluckuk will withdraw from combat at the first opportunity. Sense Motive +7, Stealth +18, Swim +3. water skin, bed roll, messenger’s scroll case, flint and steel. improvement of a creature's attitude toward the herald squire also applies to his knight. Fleet of Foot (Ex): A herald squire gains fast movement, as the barbarian class feature of the same name. If the herald squire gains fast movement from another class, the bonuses to his speed do not stack. travel each day increases by 20%. creature to whom the cavalier offered the chance to surrender (by taking a standard action to offer terms). Banner (Ex): A cavalier’s banner is a symbol of inspiration to his allies and companions. on saving throws against fear and a +1 morale bonus on attack rolls made as part of a charge. at least Small or larger and must be carried or displayed by the cavalier or his mount to function. Before Combat Teeny-Weeny normally benefits from any personal spell cast by its rider, Gluckuk. to use his slam attack when urged to do so by Gluckuk. Morale Teeny-Weeny will fight to the death if Gluckuk wishes it. by +4 as long as it does.